The editors I work for are awesome folks, and give me an amazing amount of freedom in deciding what topic I will write about and which images I will feature. In fact, the only gallery they have specifically requested was the January 2015 submission, which was a bio of me and a showcase of my all-time favourite dozen images. That was a tough assignment, in a few ways. I don’t have a hugely impressive list of publications I’ve written for, nor prestigious prizes I have won, so my résumé is a bit, er, thin. I came to the party pretty late on finding myself a published writer and photographer – in fact it was a long, circuitous, uncharted journey that went off on a few wild tangents (can you say winery partner? ;^) before finally finding a destination with my first regular gig at Sport Diver Magazine, and now with my monthly column for Scuba Diving Magazine. I don’t enter photo contests (with the exception of the Aggressor Photo Contest, which I won way back in 2004 with a whaleshark shot), and I have not been very diligent about pitching my stuff to publications. Partly lazy, partly distracted by other projects (as in building a new house), and partly realist in recognizing that there are so many talented folks out there, and very few paying gigs. I don’t even do magazine photo calls any more – the time required to surf to find the requested images, tidy them up, upload them, and then hope that they are chosen from the numerous other images that are being submitted is not adequately compensatory for me – I have had a few images chosen for various publications, but when I factor the time spent doing the submissions, and the financial returns, there just isn’t enough in it to make it worth my while. The digital era has been both a blessing and a curse for underwater photography – it has become so much easier to hone and perfect the craft when you have instant feedback in the form of an image review feature on the camera, and when you can take reams of images on any dive, as opposed to the days of film when you shot blind (in terms of exposure) and were limited to 24 exposures for one dive. The tsunami of great imagery being captured (and embellished in programs like Photoshop) means that there is so much stock out there, and that has caused prices to drop. I suspect there are just a handful of professional underwater photographers who are able to make a living from image publication alone. So, I won’t get rich doing what I do, but a paying gig for a major magazine is very validating, and gives me a reason (as if I needed one ;^), to keep diving, and shooting, and improving my imagery. I am super grateful for the opportunity, and that they sought me out to invite me to be a regular contributor. This personal blog is my way of sharing my images and experiences without formal publication. It keeps my writing tools sharpened (and it is amazing how quickly they get rusty when I don’t use them!). 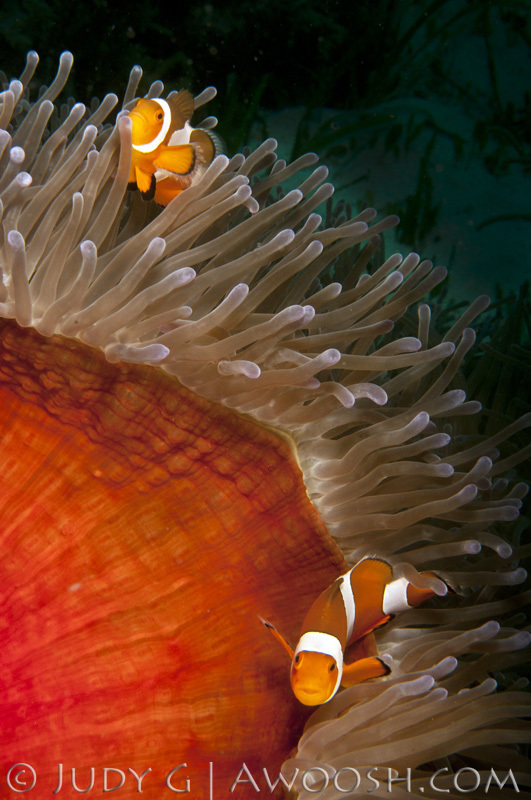 So after that little ramble, here is my Pic of the Day – a Magnificent Anemone with a couple of False Clown Anemonefish. As I wrote earlier this week, it is impossible for me to swim past an anemone without stopping to check it out. These magnificent anemones are gorgeous animals, especially when their undersides are revealed, as in this shot – but interestingly, without a flashlight or strobe, that vibrant underside actually appears green at depth! Red disappears very soon after you start descending (all to do with colour wavelengths). So blood under the surface looks green too! The colours that are shorter in wavelength remain truer at depth (green, blue, indigo, violet). This entry was posted in All About Scuba Diving, Pic of the Day and tagged false clown anenomefish, magnificent anemone. Bookmark the permalink. Absolutely gorgeous little feller. Thanks for sharing. Thanks Richard! Great to hear from you!